Esplora la città più antica delle Americhe in questo tour a piedi di Santo Domingo. 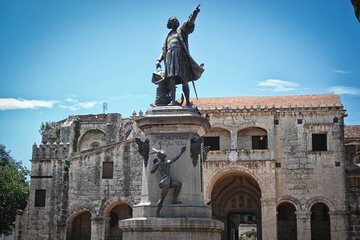 Durante questa escursione di un giorno da Punta Cana, segui la guida locale per vedere alcuni monumenti coloniali del V secolo, Las Damas Street e Diego Columbus Alcazar, la prima cattedrale costruita nel nuovo mondo. Fai una sosta al National Presidential Palace, goditi fantastiche vedute del centro e guarda un film in 4D sulla storia della città. Pranzo in un ristorante tradizionale dominicano e trasporto di andata e ritorno dagli hotel di Punta Cana sono inclusi. It has been 40 years since my last visit and I was amazed and disappointed at the immense change the Capitol city had taken, traffic, garbage, dilapidated housing, slums, over-populated. However once we entered the old city and toured the various venues it was great!!. Santo Domingo is the oldest city in the western hemisphere and was founded in 1502. You will be able to visit all the old city and the house that Columbus built. It is about a 2 1/2 hour ride from Punta Cana but it is well worth the time if you enjoy historical places. The old churches are amazing and the local tour guides are very sharp. You will be provided headphones for all the walking tour and the trip will be about 2 miles of walking. Definite trip for your itinerary. The biggest problem with educational type tours is understanding the speaker. Even speaking English it was hard to understand the guide. We enjoyed all the locations and the meal. I felt too much time was spent at the church and the shopping area we were taken to was just a very over-priced souvenir shop. Most of the itinerary listed on the tour such as sightseeing was simply just riding on the bus, also alot of the time was taken up by picking up other tourists transferring from one bus/shuttle to another. If you are staying in Punta Cana for all your stay in DR its a great trip to see something different and a historic capital. It also gives you an opportunity to see the countryside along the 3 hour trip there. We left Punta Cana at 7am and arrived back at 7pm. the guide had arranged for two rest stops in the am and one in the pm, which was great! the tour involved the inner city and historical area where Columbus would have landed and the house where family lived later. That was educational. This is a walking tour. We had a fabulous buffet lunch in a restaurant. one stop at a cathredral a play about pirates which could have been skipped, and a shopping hour at the end. It was enjoyable. We had one downpour of rain and they hurried and got umbrellas for us! The 2nd guide in the museum was very repetitive in his speech and I would have preferred the first one to keep going. It was a successful day and we enjoyed it, and learned a lot! Great trip visiting DR's capital. Pick-up was on time. Guide Nacho was entertaining and very knowledgeable. Driver Melbin was a safe driver. Sites were amazing! Lunch was just ok. Unfortunately, whole trip back was in the heat - air conditioning in bus not working.